A lot of people will know Mark Beaumont for his epic round the world bike ride of 18,000 miles in which he broke the world record by 82 days back in 2008. Riding his bike for long periods of time is obviously something Mark does extremely well and his latest challenge lay on the North Coast 500. 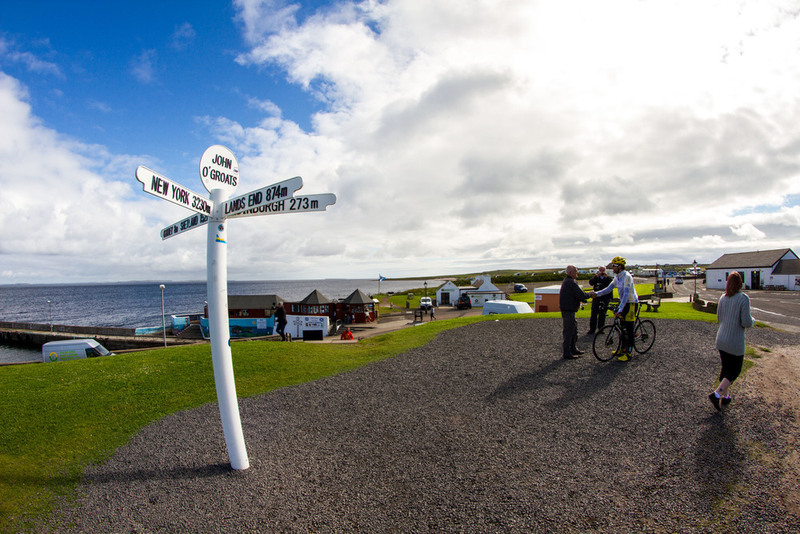 This route is Scotland's answer to Route 66 starting and is a 500 mile journey which takes you through beautiful areas of Scotland. Mark's plan was to cycle non stop the route in under 40 hours leaving Inverness at 0600 on Monday morning. Cycling over 500 miles yourself must get quite lonely and it was great seeing different people grab their bikes and cycle with Mark. Various riders showed up along the route, from his friend Alex Glasgow, local cycle club riders, people inspired by his rides and those who were encouraged to join in by the crowd. The Bealach na Bà on the Applecross peninsula would seem challenging but once he had reached the top of the windy roads he was chatting easily to his friend Alex Glasgow (currently holds the record on the Bealach Mor and previously won the Celtman). The good weather didn't last all day and Mark powered on through the rain. Being on the West of Scotland we were all greeted by waves of midges and no wind to blow them away. With his ride being non stop, Mark rode though the night and the weather didn't hold off. Dark, wet and windy he powered through making it look easy. I stopped in a lay by just after Inchnadamph, and while asleep in the back of my car he had made it up to Tongue by the time I caught up with him in the morning. This was a historic spot for Mark to get to. When he was 15 years old he did a solo ride from Lands End to John O' Groats. Thankfully the sun came out and stayed with us until the finish. Arriving in Wick was a great milestone of the journey and thankfully the crew were met by the staff from the North Coast 500 with bacon rolls. After meeting a couple of fans on a bridge over the A9 I headed straight to Inchmore to catch Mark during his last few miles. It was amazing to see him still pushing hard with smile on his face. After reading about Mark and hearing all about his adventures around the world it was brilliant to see him actually doing one. It was great getting the opportunity to follow this journey and see first hand the endurance that he has. His time was 37 hours and 58 minutes and at the finish looked and sounded as if he could go for another ride.